Regular readers might (just) remember that one of my top 10 trends for 2009 (i.e. last year) was ‘Digital Diets’. It didn’t happen. But wait…it’s happening now! This is just in from Sean Boyle at JWT in New York. 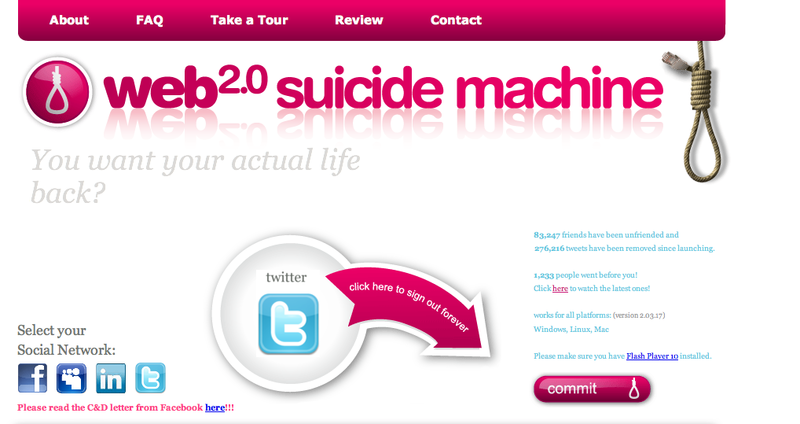 Rock star John Mayer has blogged* that his fans should join him for a weekly ‘digital cleanse.’ Meanwhile, if things really get too much you can now use something called the Web 2.0 Suicide Machine. No, this isn’t anything physically nasty. Just a way of getting rid of your digital friends. Once you nominate a social network you relinquish your login details to the machine and it proceeds to change your password so that you can no longer access your account. It then systematically deletes every one of your friends from that particular platform and frees you from the shackles of social media.Facebook has blocked the application but Twitter, MySpace and LinkedIn have yet to do so. * I know, the irony of doing this on a blog! This entry was posted in 2010 Trends, Predictions. Bookmark the permalink.